Alex Dickerson at bat for the El Paso Chihuahuas. Summary: In their second season since relocating from Tucson, the Chihuahuas put on an impressive second half push to make the playoffs before losing to the Houston Astros’ loaded Fresno Grizzlies affiliate in the first round. 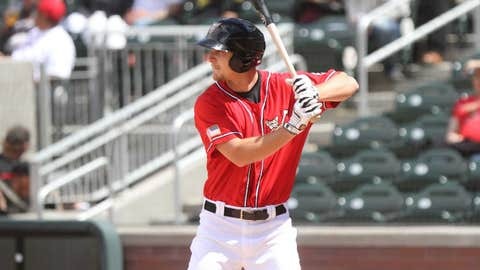 Offensively, El Paso was a veteran team led by a talented trio of Alex Dickerson, Jake Goebbert and Rymer Liriano in the outfield along with Cody Decker, who led the organization in home runs for the second straight year, and catcher Rocky Gale, who continued to improve. Poway High School graduate Alex Dickerson led the Chihuahuas with an .877 OPS and finished in the top ten in the PCL in doubles and triples. Rymer Liriano was still considered the top position prospect by most of the MadFriars’ writers, although one did select Dickerson believing that his left-handed bat would be a better fit for the big club. On the mound, a trio of thirty-something hurlers started 82 games for El Paso, which had a 4.57 team ERA good for second-best among the six desert clubs that give the PCL its offense-friendly reputation. Chris Smith, a thirty-four year old former coach, had the best year on the mound but the top prospect was reliever Jon Edwards, who came over in the Will Venable trade. MadFriars’ Kevin Charity caught up with Felix Chavez, the beat writer for the El Paso Times to get his thoughts on the 2015 Chihuahuas and Sam Geaney, the Padres’ Director of Player Development, concluded his six-part interview series with a final segment on the Triple-A team including what it’s like to give some long time minor leaguers the news they are going to the big leagues. Tim Hagerty has been with the Padres’ organization since 2005. After starting out as an announcer in Mobile, Hagerty was promoted to Triple-A in 2007 where he covered the Portland Beavers. Since then he has moved with the Pacific Coast League affiliate first to Tucson and now El Paso. We caught up with Tim to discuss the rise of the Anti-hero and the improbable playoff run. You have been with the Padres organization for a decade now, including moving cities three times in the past six years. How has El Paso compared to Tucson and Portland? Was there a drop-off in fan excitement from year to year? Tim Hagerty: El Paso’s enthusiasm for the Chihuahuas is incredible. I loved Portland and Tucson, and those clubs had great fans, but El Paso has a passion for the team that is unmatched anywhere in the minors, in my opinion. I admit I’m biased on that comparison, but many experienced players echo that ranking. Crowds are loud and the city follows the team closely. It’s special. The Padres’ Triple-A affiliate made the playoffs for the first time in nearly a decade. What made this team special compared to years passed? Tim Hagerty: There was an added enthusiasm to the playoff race because it was unexpected. The Chihuahuas were 9.5 games out of first place in mid-July. Even the most optimistic observer would admit the postseason was unlikely. Another reason was how late in the season the clinching occurred. The Pacific Coast League’s schedule is 144 games and on the morning of game 143 El Paso and Las Vegas had identical records. Ever since Cody Decker’s video last year pranking Jeff Francoeur, he has become almost a cult favorite in San Diego. How was he perceived in El Paso? Tim Hagerty: He’s beloved here and he reciprocates it. It wasn’t uncommon to leave the ballpark an hour after a game and see Cody on the sidewalk holding court with a group of fans he had never met before. "Is Cody coming back?" is the off-season question I’m asked the most. The Chihuahuas were "Pat Murphy’s team" until he was promoted. How did the team transition to new manager Jamie Quirk? Tim Hagerty: That was a memorable time in Chihuahuas history. The transition came during a short, three-game road trip to Albuquerque. They left town with one manager and came back with a different one. The two managers had different styles. Pat Murphy’s hijinks kept the clubhouse loose, Jamie Quirk’s preparation kept the team disciplined. The team played well under both, so it shows there’s no template for being a winning manager. Rymer Liriano was the top prospect in Triple-A entering the season. While he didn’t set the league on fire like he did in 2014, he seemed to improve every month. Did you notice any change in his approach throughout the year? Tim Hagerty: Rymer quietly had a solid season for El Paso. Pat Murphy observed how patient Liriano has become. He led the Chihuahuas in walks. The 34-year-old Chris Smith led the team in strikeouts and ERA, all while throwing more innings than he did in the last four years combined. What made Smith so effective? Tim Hagerty: Jamie Quirk says Smith "knows who he is." He throws slowly but accurately and looks composed whether the bases are loaded or the bases are empty. Smith and Daniel McCutchen in the rotation were a big reason why El Paso won the division. Colin Rea struggled in El Paso after an outstanding first half in San Antonio. What were your impressions of Rea? Tim Hagerty: There are many recent Padres examples of successful Double-A pitchers who struggled briefly after being promoted to Triple-A. Matt Wisler in 2014 comes to mind. Most Texas League opponents are in their mid-20s like Rea and it’s an adjustment when a pitcher is suddenly facing Triple-A lineups full of major league experience. So, I wouldn’t read too much into a few bumpy Triple-A starts for anybody. The Padres knew Alex Dickerson could hit, but he seemed to have already been tagged with the term "player without a position." How did he look from a defensive standpoint in the outfield? Tim Hagerty: Both 2015 Chihuahuas managers commented on Dickerson’s commitment to improving defensively. Jamie Quirk relayed a story of Dickerson saying "my goal is to back up an outfielder and get to a ball and make everyone say ‘where did he come from?’" It was true. Dickerson consistently hustled, even on balls that weren’t hit to him. Hunter Renfroe was promoted to Triple-A and almost immediately hit a home run about 500 feet to left field. What were your first impressions of the right fielder? Tim Hagerty: Travis Jankowski was called up when the club was in Nashville and in a tight pennant race, and I thought his departure might mean El Paso would finish second. But then Jake Goebbert heated up and Renfroe arrived. He hit a number of long home runs, including a few in Memphis in front of a couple dozen family and friends who drove up from Mississippi. Jamie Quirk said Renfroe looked as comfortable as he’d ever seen him, and that’s a qualified eye, Quirk managed Renfroe at three different levels. Renfroe made an incredible throw from right field to third base in Game 4 of the playoff series, as strong of a throw as I can remember seeing. I think Renfroe’s as advertised. If he’s a Chihuahua in 2016, it may be a brief stay. Anything else you would like to add about this extraordinary playoff season? Tim Hagerty: Can’t wait to broadcast the next Chihuahuas season. 176 days away.